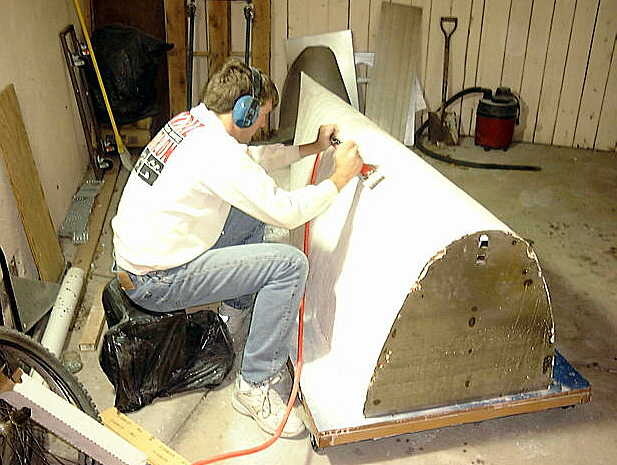 By March, we were putting the second and third coats of plaster on the part that would make the positive of our rear cowling. 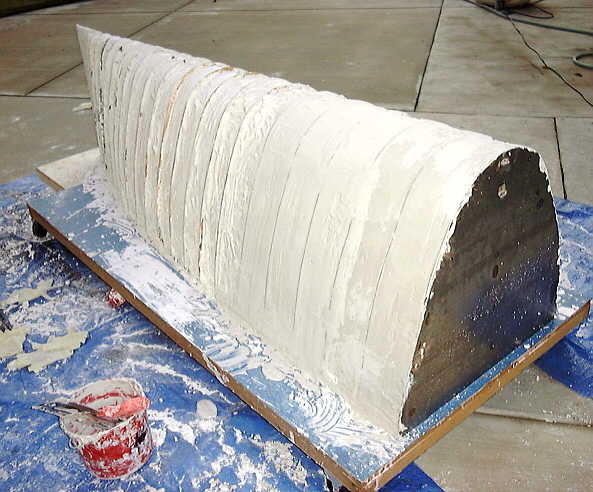 The second coat was thicker and dryer than the first, but still took quite a while to apply. It is finally starting to look like a part though. Behold, the Binford power-rasp. This baby would scrape the hide off a rhino. Tim Tailor would be proud. 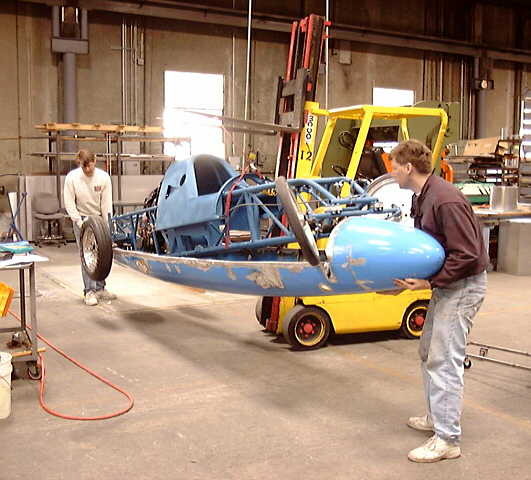 The rear cowling wasn't the only place that needed fiberglassing, the front canopy also needed a mold, and we used a simular technique. Unfortuantly, it became very obvious that it was too fraigle to remove from the car. 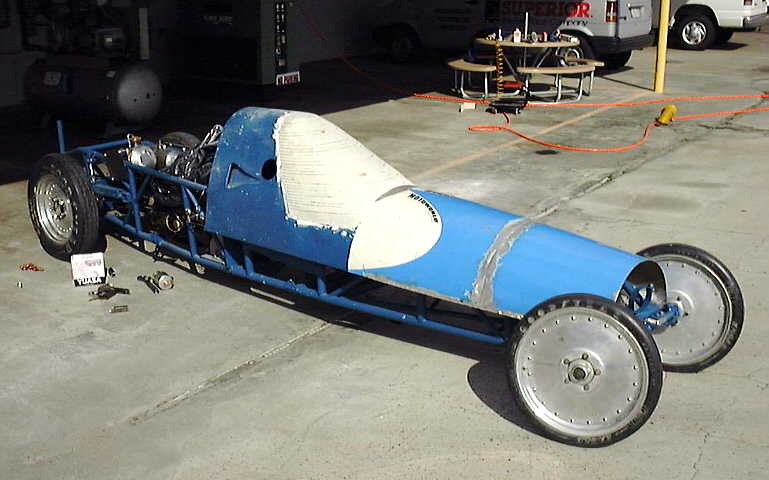 That caused a real problem, becuse we needed the mold made, and the car finished. There was only one man who could save the day. Alan called Paul at Composite Sports and asked if he could make a mold fast! Paul asked how fast did we need it? A week? a few days? Alan said "tonight?". And that started our relationship with Composite Sports. We brought down the entire car and wheeled it into Paul's shop where he layed up a mold for us. As soon as he was finished, we packed up the car. The next night, Alan and I removed the mold, and as we expected, the plaster positive crumbled away. We cleaned up the mold, fitted it to a frame, and added a rubber inset to make a place for our windshield to go. A few days later, brought the mold back to Paul, and he made a Carbon-Fiber/Kevlar piece for us. 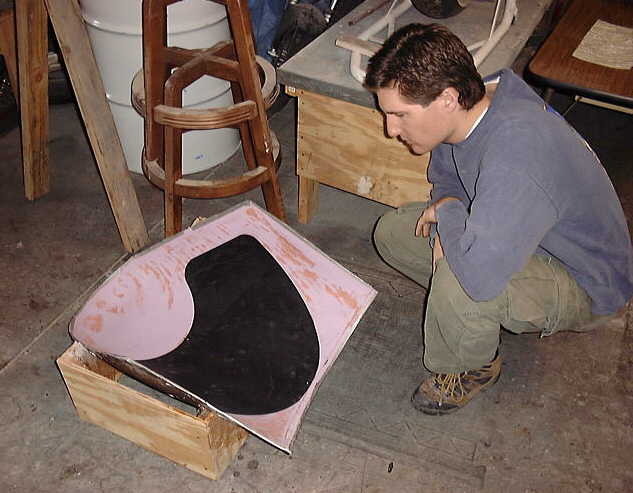 Paul inspecting the mold before making the Carbon-Fiber/Kevlar canopy for us. It was now about the beginning of April, 2001. After this point, we started sending out perodic newsletters, and it was those newsletters that evedentually became the basis for this web page. The first one was dated 04-09-01. The mahem that led up to this point can be seen at Early 2001. Or for an over view of the entire project, use the link below.